Always follow your intuition. That gut feeling you have in the pit of your stomach usually tends to be right. Always follow it. If you're proven wrong later on then fine, but normally your first instincts tend to be right. Making plans are a waste of time. You spend all this time planning and preparing something and sometimes you can be let down by people or situations that are out of your control. Always best to let things happen naturally. Treat Others How You Expect To Be Treated. Nastiness never gets you anywhere. Always be kind and respectful of others. Even if you aren't keen on someone or a situation just be kind and think about how you would like to be treated in that situation. Skincare is more important than make up. I have never been a make up girl. Kinda ironic for someone who has a beauty blog but I just prefer everything skincare. I'd rather spend money on masks, cleansers and beauty products to improve the condition of my skin rather than covering it up with products that at the end of the day really aren't that great for you. Nobody is perfect. Not even you. I think this is something we need to remember. Perfection doesn't exist and even though we see perfection streamed across social media, magazines, newspapers and even on the television we need to realise that we never know what's going on behind closed doors. Your own mental health has to come first. Nothing is more important than making yourself happy and improving your own mental state. It has to come over everything in life. Nights out aren't as fun as they used to be. I've been on a few nights out recently and I don't think I felt awake past 10PM. I remember thinking all I want to do is go home, get into my bed with Netflix and a bar of chocolate and just slowly fall asleep. Definitely the granny in me is coming out. Having goals are important. You don't realise this early in life but it's so important to have something to strive towards. Not only can it further your career but it can also make you a better person. They don't have to be major goals but having little ones that you can slowly tick off will just make you feel a lot better and will make life more interesting as well. It's the little things in life that really do make a difference. Small things like watching a funny film, have a friend being chocolate round your house when you're having a bad day or even just going for a walk and having a cute dog walk past are all things that can make you smile and improve your mood. You realize that you never feel like an adult. I am 26. I am not going to lie, I still feel like a 16 year old. How has it been 9 years since I left school? I still feel like I should be in school! You won't be everyone's cup of tea. Not everyone will like you and that's okay. Just like you won't like everyone else. Not everyone will see eye to eye but like the point I made above about treating others how you like to be treated yourself, nastiness will get you nowhere. Just be civil. Everyone 5 or more years younger than you is and always will be 12. I think everyone over the age of 22 can agree with this one and I definitely think it's self explanatory. Now I know how 25 year olds felt when I was younger! Mistakes Happen. It's just human nature. Don't beat yourself up about any mistake you make. Just learn from it. We are all human we all make mistakes even if they are things we can control. Take lessons from them and move on. At the end of the day mistakes are needed to make us better people. Having a good old cry is sometimes necessary and will make you feel better afterwards. I speak from personal experience here. This past week has been awful and I have felt so unhappy and have spent most of the time crying in private. Not good when you work in customer service and have to put on a happy face, however you'd be surprised how good you feel afterwards. Sometimes a good old cry is just needed. Stepping out of your comfort zone is absolutely worth it. Yes playing it safe is the easier option however doing things you wouldn't normally do like go for a job you've never done before but really want or taking part in something you would normally be too scared to do are all things that can lead to better things and make you grow as a person. Before you expect anyone else to love you it is more important to love yourself. This is one I've realised and I am still working on. Self confidence is a big thing and I personally believe before I can expect anybody to have confidence in me I need to have confidence in myself. Music is everything. Singing your favorite song at the top of your lungs will make you feel even better. Music is one of the most important things in my life. It's the one thing that gets me and a lot of other people through very difficult times. I personally love locking myself in my room, playing my music as loud as possible and just having a good old sing to my favorite songs. These are things that can really improve your mood. People come into your life for a reason. 2017 has been a big year in terms of people coming in and out of my life and this is a line that is taken from my favorite musical Wicked but I think it's so true. Everyone that comes into your life is there to learn something from. Everyone you meet makes you grow in ways you never realise you could grow. Never dream is ever to big. Don't let anyone ever tell you your dreams are not achievable. If you work hard enough at something anything is possible and it's down to you to make sure you achieve whatever it is you want to achieve. Spend as much time with family as possible. Especially your grandparents if you still have them. I have one grandparent left and she lives half way around the world in Mauritius so I rarely see her which makes me sad as I know how important grandparents are. I wish I had the opportunity to spend more time with all of mine. The wisdom they have and the advice they give you will stay with you forever. No matter how much you don't want to be...you do become your parents with every passing day. I always get told by my Mum you're like your dad and vice versa from my Dad. You think to yourself no way at times but it really is true. You'll always pick up little traits here and there that you never thought you would. Pamper evenings and netflix nights become the new clubbing. There's nothing I like more than putting on a new face mask whilst watching my favorite TV show with chocolate or pizza beside me as I do it. I couldn't think of a better way to spend an evening to be honest. Your siblings will always be your best friends despite all the bickering. Your siblings afterall know you better than anybody. They are normally the first people you go to after an argument with the parents and they are there on every important event. They really are your best friend. Sleeping, and getting as much of it as possible becomes a top priority. Even over eating. Sleeping as an adult is something you never get much of. At all. So it is something we have as much of as possible even if it does mean a 40 minute nap at work we will take it. The best policy in life really is honesty. I really don't understand this whole lying to people who are there to support you business. If you don't want to tell someone something then fine. You're under no obligation to however lying to people will never get you anywhere and often comes back to bite you in the bum. Just be honest. Don't Wish Time Away...Live In The Moment. This goes without saying really and we're all guilty of doing it even me. I wish it was next year, I wish it was tomorrow, I wish etc..At the end of the day nothing is more important than living in the moment, especially with everything going on in the world at the moment. We never know what tomorrow will bring. On that note I think that is the end of the post. This is definitely a lot longer than I expected it to be but I hope you enjoyed this post and I hope you enjoyed the photo collage of me I've included at the beginning. 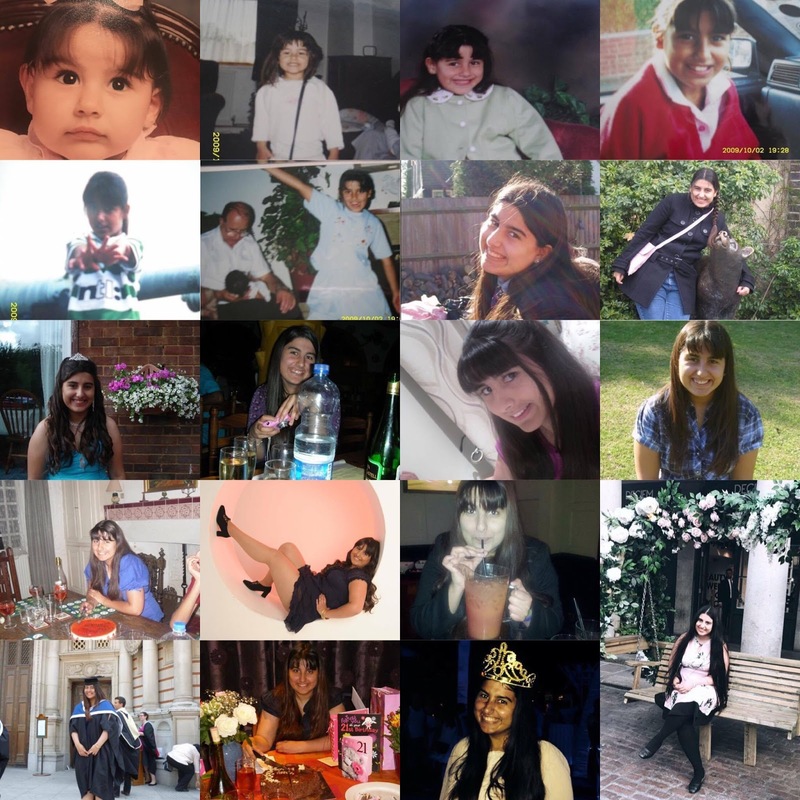 Welcome to Fleur through the ages. Now it is time for me to go and celebrate my birthday by eating all the cake and drinking all the prosecco. Have a good day guys!